Kenneth Castleman has a PhD in biomedical engineering. He has served on the faculty at Caltech and The University of Texas and on the research staff at USC and UCLA. He has published three books and over sixty scientific articles. He has also served on advisory committees for several universities and government agencies, including The National Institutes of Health, NASA, and the FBI. Electroconvulsive therapy (ECT or “electroshock”) is a psychiatric procedure that is frequently used to treat depression and other mental disorders. Psychiatrists long ago got the idea that having a convulsion could be therapeutic for patients with mental illness. In contrast, neurologists do everything they can to prevent convulsions and seizures. Yet, for the past eighty years or so, convulsions have been induced in the mental health system by running an electric current through the brain. ECT does this by applying a voltage to electrodes placed on the patient’s head. However, the amount of electricity used is commonly six times what is needed to cause a convulsion. Based on their own research, psychiatrists admit that ECT gives only temporary results, and then in only about half of the patients they treat. Very often the ECT recipient is still prescribed psychiatric drugs and requires more, so-called “maintenance” ECT treatments. ECT is much more successful, however, in funding the psychiatric industry. The treatments are inexpensive to deliver, and ECT brings in about two billion dollars per year in the USA alone. The institutions that administer ECT profit handsomely. It is interesting to compare psychiatry to physical medicine. It is possible for a cardiologist to develop a good understanding of the human heart since it is simply a muscle that pumps blood. Thus modern cardiology practice is the result of a rather thorough understanding of the organ under treatment. Psychiatrists, on the other hand, are working with an infinitely more complex organ—the human brain. Their procedures are based on an extremely elementary understanding of the organ they treat. Compared to modern cardiology, psychiatry is operating at the stage of alchemy and witchcraft. Their methods are as crude and ineffective as medical practice was in the 1700s when George Washington’s physicians bled him to death to treat his fever. Besides a lack of sound scientific basis, psychiatry suffers from two other drawbacks that limit its effectiveness. First, psychiatrists assume that all of human behavior is simply the result of brain function, steadfastly ignoring the possibility of any spiritual aspect of or holistic approach to human existence. Second, psychiatry seems to attract into its ranks some individuals who have issues of their own or whose purposes go beyond claims of healing the sick. ECT was first used in 1938 when an Italian psychiatrist, Ugo Cerletti, observed pigs in a Rome slaughterhouse being anesthetized with electroshock before being butchered. His first human patient begged Cerletti, “Non una seconda! Mortifierel” (“Not another one! It will kill me!”). Today, even well-intentioned recruits are forced to perform brutal treatments on helpless patients during their training. This forces them to begin treating patients on the basis of someone’s opinion and vague theories rather than on scientific fact. Consider a pump causing water to flow through a pipe. The pump generates pressure, which forces the water to move. The higher the pressure, the faster the water will flow. The pressure can be measured in pounds per square inch. The rate of flow can be measured in gallons per minute. The pressure is the cause, and the water flow is the effect. In a similar manner, consider a light bulb connected by wires to a battery. The battery acts as a pump, forcing electrons (tiny charged particles) to flow through the bulb. This flow of electrons is an electric current. The rate of flow of the electrons (the “current”) is measured in units called milliamperes [milli = meaning “one thousandth” and ampere, a unit of current, amount of charge flowing per unit of time.] The “pressure” produced by the battery is its voltage, measured in volts [a unit of electrical force]. The higher the voltage, the more current will flow. The voltage is the cause, and the current is the effect. 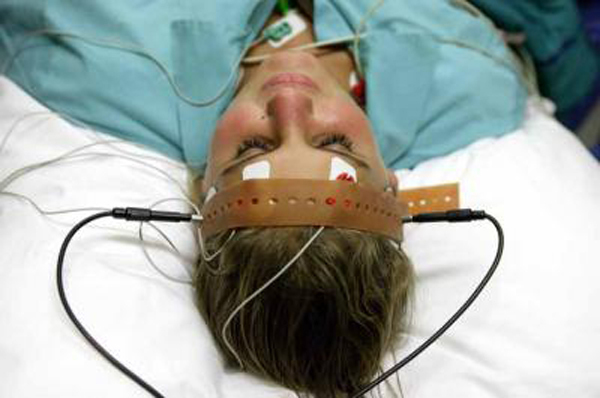 In ECT, a voltage is applied to two electrodes placed on the patient’s head. This voltage, as high as 460 volts, creates an electric field inside the patient’s skull. This electric field puts a force on the electrons inside the brain, causing them to move. This movement of electrons is a current flow of up to 900 milliamperes. By contrast, brain cells normally operate with less than one-half of a volt and a fraction of one milliampere. Two things happen when an electric current flows through the brain. The first is heating. Electrical energy is converted into heat inside the brain, raising its temperature. The larger the current, the more heat is produced. If the temperature gets too high the cells will suffer temporary injury, permanent damage, or even death. It is the cell wall (“membrane”) that holds the cell’s contents inside and keeps everything else out. This membrane contains electrically charged molecules (small groups of atoms) which are also affected by the ECT-produced electric field (see Figure 1). If the voltage is high enough, the resulting forces can tear holes (“pores”) in the cell wall. 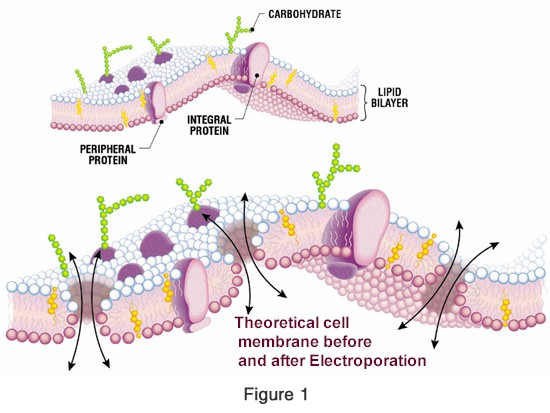 This process is called “electroporation,” the production of pores by electrical means. It is the second effect that electricity can have on the brain. At low voltage levels the forces are not strong enough to tear holes in the cell wall. At higher voltages a few small holes appear (see Figure 2), but they are quickly fixed by the cell’s built-in repair mechanism before too much foreign matter can leak inside. If the voltage is high enough, however, the holes produced are too many and too large, thereby overwhelming the repair mechanism. Toxic material rushes in, and the cell dies. In biological research, electroporation is used to force drugs into cells through temporary pores. In medicine it is used to kill cancer cells. In psychiatry brain cell damage by electroporation is a likely byproduct of ECT. An electric field affects large cells more strongly than small cells. Since brain cells have fibers that extend over long distances, they are larger and much more at risk of electroporation than the smaller cells that live inside the skull. Because of their size, the brain cells will be the first ones to die. Early ECT devices applied the voltage to the electrodes in a small number of pulses lasting up to a tenth of a second each. The ECT treatments lasted only about a second. In an attempt to reduce the heating effects, modern ECT devices now use a very large number of very short (“ultra brief”) pulses that last less than one microsecond (a millionth of a second). That is, the current flows for a very short time, and then it is off for a longer time. Since the current is off most of the time, the ECT treatment has to last longer to create the required convulsion. 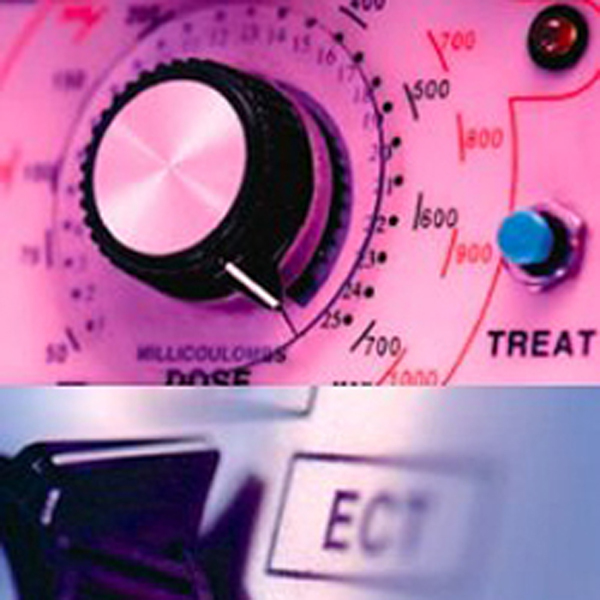 ECT treatments now usually last up to eight seconds. Arguably the modern “Ultra-Brief-Pulse” devices produce less of a heating effect in the brain because the brain tissue has some time to cool off between pulses. However, the large numbers of ultra-brief pulses exert much more damaging forces on the cell wall. Instead of hitting the cell with a few well-spaced blows, it is more like a machine-gun effect, ripping at the molecules in the cell wall. 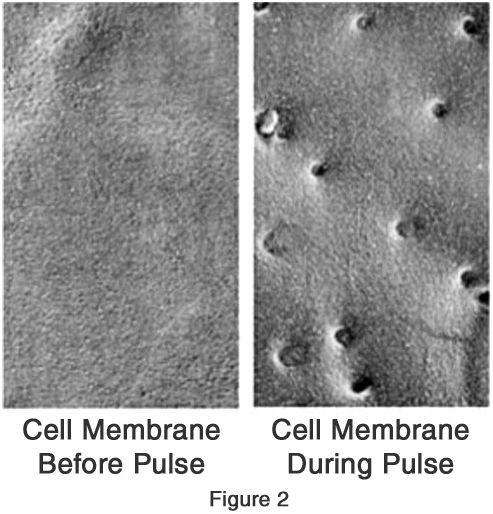 Ultra-Brief-Pulse ECT is much more likely to cause cell damage and cell death by electroporation than the older technique. So the newer devices have traded off one problem (heating) for one much worse. A lot of ECT research has been published in the scientific literature. Despite this, no convincing explanation of how it can possibly cure anything has ever emerged. Very little of this research addresses the problem of brain damage, and many of these studies do show evidence of changes in the brain caused by ECT. Almost none of the research focuses specifically on damage to the brain cells themselves. Electroporation has been well studied as a means for killing cancer cells in the brain, but unintended cell damage by ECT has received essentially no study at all. Done properly, science is not easy. Very rigorous standards must be followed in order for scientific research to be valid. Statistical analysis must be carefully done and properly interpreted. Extreme steps must be taken to prevent the preconceived ideas of the investigators from influencing the outcome of the experiments. Careless researchers will always get the result they expect, whether it is the correct one or not. Most fields of science work very diligently to ensure that the body of scientific knowledge remains pure. The United States Food and Drug Administration (FDA) was given authority to regulate medical devices in 1976. ECT devices were already in use by then, so they were automatically approved without any testing for safety or effectiveness. In response to public pressure to ban ECT, the FDA has held several hearings over the years. Each time they continued to approve ECT devices without requiring any further testing by the device manufacturers. The FDA normally sets a high standard for approving drugs and devices for public use. They require stringent clinical trials with large sample sizes, accurate statistics, and thoughtful interpretation of results. To say they have a double standard where ECT is concerned would be an understatement. Their committees listen to hours of testimony from patients whose lives have been ruined by ECT, and then they conclude that the practice is safe and effective. They accept the opinion of psychiatry experts in lieu of valid scientific research. They rely on data supplied by experts who make huge sums of money in the psychiatry industry. Normally when an FDA-approved device is modified it must be re-tested before the new design can be sold. The exception comes when the new device is considered to be “equivalent” to the older model. Psychiatric experts argue that the new Ultra-Brief-Pulse devices eliminate the risk of brain damage, which older devices admittedly posed. At the same time they argue that the new models are “equivalent” to the old ones. Surprisingly, the FDA has been quick to accept both of these contradictory arguments. The new devices cannot be both different and equivalent at the same time. The FDA currently places ECT devices in Class 3 (“unreasonable risk of illness or injury”), along with automated cardiac defibrillators, for example. They are currently considering moving electroshock devices to Class 2 (“safe and effective with suitable controls”), which includes such things as powered wheelchairs, acupuncture needles, and condoms. This change would allow greatly increased use of ECT. 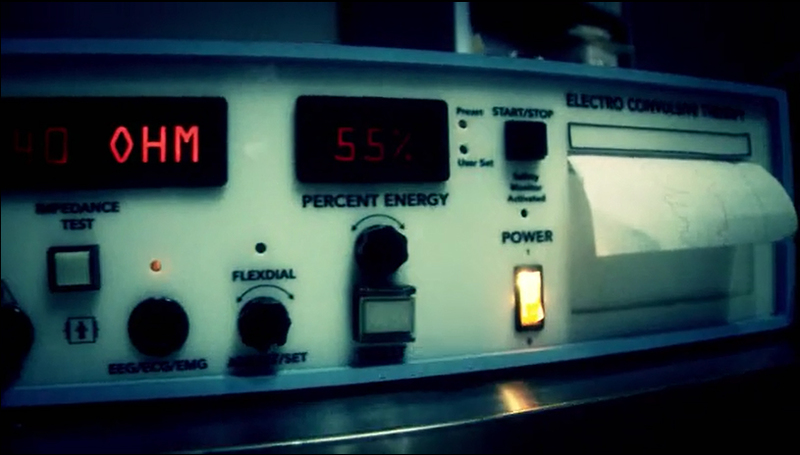 ECT attempts to treat mental disorders by sending a large electric current through the brain. At best it gives only temporary results on half of those treated, while still requiring maintenance on psychotropic drugs and additional ECT. No one can explain why ECT does what it does. There are only theories. What we do know is that it induces seizures that generally last from 25 to 45 seconds. ECT risks brain cell damage both from heating and from electroporation. Modern Ultra-Brief-Pulse ECT devices are much more likely to cause electroporation than those used in the past. Adequate scientific studies to assess the risk of ECT-induced brain damage have not been done. In spite of this, the FDA wants to open the door to much more widespread use of ECT than ever before. To say that your brain needs a 460-volt electric shock is like saying your computer needs a lightning strike.